Happy Loving Day! Today is the 41st anniversary of Loving v. Virginia, the 1967 Supreme Court ruling that legalized interracial marriage in the United States. And Juneteenth, the anniversary of the real end of slavery in the U.S., is in just one week! Read on for more information about these holidays and how you can celebrate them. In the 1950s, two teenagers named Mildred Jeter and Richard Loving fell in love in a town just north of Richmond, Virginia. Mildred was of Cherokee and Rappahannock American Indian and black racial heritage, while Richard was European American. In 1958, Mildred and Richard decided to marry. In order to avoid Virginia’s Racial Integrity Act, a state law that made marriage between white persons and non-white persons a felony, they drove eighty miles from their home in Virginia to D.C. 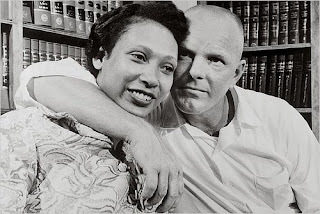 Upon returning home, the Lovings were found guilty for violating the ban on interracial marriage, and sentenced to 25 years of exile from the state of Virginia. In 1963, the ACLU helped the Lovings challenge the state’s ruling. As the case progressed, several church bodies declared their support (or non-prohibition) of interracial marriage, including the Presbyterian Church, the Roman Catholic Church, and the Unitarian Universalist Association. In 1967, the Supreme Court declared the Racial Integrity Act unconstitutional, thereby ending all race-based restrictions on marriage in the United States. According to recent U.S. Census Data, today almost 5% of marriages in the United States are interracial. “Loving Day,” the anniversary of the Supreme Court’s decision, is celebrated as “an educational community project . . . to fight prejudice through education and to build a sense of community among people who engage in meaningful interracial and intercultural relationships.” You can find all kinds of great resources at lovingday.org, including a list of celebrations happening across the country, a legal history of race & marriage, and a way-cool interactive map that shows which states restricted interracial couples over the years. Happy Loving Day! Coming up in one week is Juneteenth, the anniversary of the day in 1865 when Union soldiers landed at Galveston, Texas, carrying the news that the Civil War had ended and those who had been enslaved were now free. Although President Lincoln’s Emancipation Proclamation ostensibly ended slavery in the Confederate states on January 1st of 1863, the actual arrival of freedom often progressed only as quickly as Union forces moved through the South to enforce it. In April of 1865, General Lee surrendered at the Appomattox Courthouse in Virginia, and the remaining Confederate armies soon followed suit. Now that the fighting had ended, Union forces were able enforce the Emancipation Proclamation in states they had not yet reached in great numbers. On June 19th, Union troops led by Major General Gordon Granger arrived in Texas, carrying the news of the Emancipation Proclamation. Two and a half years after slavery was declared illegal, it was finally abolished in Texas. There are many ways to acknowledge Juneteenth, mourning the delay of justice and celebrating its arrival. Juneteenth can be celebrated with cookouts, prayer services, informational displays in your fellowship hall, or concerts. Juneteenth.com provides a wealth of resources, including a list of celebrations happening in the U.S. and international celebrations, the history of Juneteenth, and recommendations of how to celebrate. Check back here next Thursday for a Juneteenth blog post. In the meantime, happy Loving Day!